Mammut Women's 3 in 1 Jackets Seon 3 in 1 Hooded Hardshell Coat - Women's Iguana XS 1010266904584112. You can combine it with other Mammut Easy Combine products to suit any weather. The outer jacket banks on a 3-layer GORE-TEX material that won't leave you in the lurch in the rain. Even the splashproof 2-way front zipper does not allow moisture to penetrate. If necessary you can fasten the inner jacket to the inside of the outer jacket using snap buttons. It stands out with its ultra-lightweight 20 denier Toray ripstop material and boasts a cozy synthetic filling with Ajungilak. 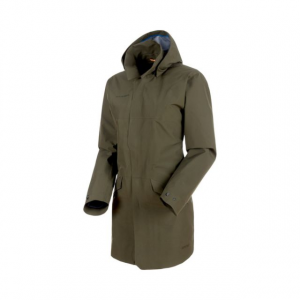 A perfect multifunctional coat that finds a wide range of everyday uses.